101 Outer Space Projects for the Evil Genius, by Dave Prochnow (2007). Not just for kids. There are plenty of projects for adults here too. Apollo’s Outcasts by Allen Steele (2012). A book for young adults about living on the Moon that gets the science right and includes an engrossing, well-crafted story. Astrobiology, by Fred Bortz (2007). This informative introduction to the fascinating topic of possible life on other worlds provides an appropriate level of background and detail. Astroblast: Moon Stone Mystery, by Bob Kolar (2010). Uses a cute space setting to encourage children to read and engage them in activities that help build observational skills. Beyond the Solar System: Exploring Galaxies, Black Holes, Alien Planets, and More – a History with 21 Activities by Mary Kay Carson (2013). Excellent resource for kids on the development of astronomical knowledge. A Black Hole Is Not a Hole, by Carolyn Cinami DeCristofano (2012). Excellent factual book about these mysterious objects, beautifully illustrated by Michael Carroll. Blast Off Doodle Book by Karen Romano Young (2015). A perfect activity book for future space artists and engineers that will engage kids in imagining their future in aviation and space. The Callahan Kids: Tales of Life on Mars by Ben Bova, Michael Carroll, Jim Denney, Marianne Dyson, Brian Enke, Tom Hill, Rebecca Rowe (2013). Ten short stories about three teen/tweens who get into all sorts of mischief at a near-future Mars settlement. The Cassini Code (Galahad Series Book 3), by Dom Testa (2010). An enjoyable episode in the continuing saga of the teen crew of the Galahad on their way through space to find a new home for humanity. The City of Ember, by Jeanne DuPrau (2004). Two preteens struggle to find a way past the unbroken blackness that surrounds their self-contained city before the generator that sustains them fails. The Comet’s Curse (Galahad Series Book 1), by Dom Testa (2005). A decent introduction to a scientifically-accurate teen space opera that gets more interesting with each book. Countdown: 2979 Days to the Moon, by Suzanne Slade (2018). This beautiful book is a perfect introduction for the younger generation who are not knowledgeable of the seminal Moon landings. Crater by Homer Hickam (2013). Crater is the name of a 16-year-old miner who must trek a thousand miles across the Moon in the company of his boss’s granddaughter. The Darkest Dark by Chris Hadfield with Kate Fillion (2016). Inspired by the childhood of a real-life astronaut, this book encourages readers to dream the impossible. Darok 9, by H. J. Ralles (2002). In a future where the human survivors of a devastated Earth live in “Daroks” on the Moon, a scientist holds the key to survival. Earth to Stella, by Simon Puttock (2006). Who wants to go to bed when there is a universe to explore? Explore the Cosmos Like Neil deGrasse Tyson by C.A.P. Saucier (2015). Part of the book series “A Space Science Jouney,” this book intertwines space science with biographical information about astrophysicist Neil deGrasse Tyson. Exploring the Solar System, by Mary Kay Carson (2008). A solid history, full of information, stories of scientists, lovely photographs, and some worthwhile activities. Faraway Worlds, by Paul Halpern, PhD (2004). Explore and imagine living on worlds around distant stars through this fantastically illustrated and superbly written book. First on the Moon, by Barbara Hehner (2000). This book provides an up-close look at what an astronaut would see from the surface of the Moon, and also an excellent source of historical information for young students. Galileo’s Universe, by J. Patrick Lewis (2005). An amazing “pop-up” biography of one of humanity’s most important scientists. Greetings from Planet Earth, by Barbara Kerley (2007). This excellent novel about life, war, and space is full of great science detail and important issues for young people to consider. Hey-Ho to Mars We’ll Go, by Susan Lendroth (2019). A captivating version of the classic, The Farmer in the Dell. As an introduction to STEAM (science, technology, engineering, art, mathematics), the book is a valued addition to any family library. Home on the Moon, by Marianne Dyson (2003). Describes the resources on the Moon and walks students through what it would take to establish a lunar settlement, while adeptly providing young readers the technical information required in real-life terms they can easily understand. Ilan Ramon: Israel’s First Astronaut, by Tanya Lee Stone (2003). Engagingly balances the sad reality of the loss of the Columbia crew with the personal story of this upbeat man. In the Shadow of Ares, by Thomas L. James and Carl C. Carlsson (2010). A Kindle e-book about the first child born on Mars who, at age 14, tries to uncover a mystery. Kids to Space, by Lonnie Jones Schorer (2006). What is the recipe for the ultimate space reference book? Take 6,000 students, 18,000 of their questions, and 83 experts to answer them. Killer Rocks from Outer Space: Asteroids, Comets, and Meteorites, by Steven N. Koppes (2003). Read this book and become an “armchair expert” on asteroid impacts over a weekend. LEGO Space: Building the Future by Peter Reid and Tim Goddard (2013). A combination coffee table book and picture story book that tells a tale of humanity’s future spaceward expansion using only LEGO blocks. LEGO building instructions are included. Life on Earth – and Beyond by Pamela S. Turner (2008). Inspiring account of scientist Chris McKay’s search for life in extreme environments. Look to the Stars, by Buzz Aldrin (2009). Aldrin puts the accomplishments of Apollo into the personal and historical context of the human quest to reach the stars. Man on the Moon, by Anastasia Suen (2002 reprint). In this illustrated book, young readers learn about the exciting Apollo 11 voyage to the Moon by three brave astronauts. Mars (Updated Edition), by Melanie Chrismer (2008). A great first introduction to the red planet for new readers. Max Goes to Mars, by Jeffrey Bennett (2006). Max the dog joins a crew searching for life on Mars, making for a fun and educational story that all future Martians are sure to enjoy. Max Goes to the Moon, by Jeffrey Bennett (2003). Max the dog visits the Moon in a scientifically-accurate and a wonderfully-illustrated book for young children. Max Goes to the Space Station by Jeffrey Bennett (2013). Kids can learn about the ISS from a book that actually went to the ISS! Meet the Planets, by John McGranaghan (2011). Enjoy a Favorite Planet Competition with captivating illustrations and lively and accurate text for ages 5 and up. Miguel and Michelle Visit Spaceport America by Loretta Hall (2017). This book captures the experience of two children on a school field trip to New Mexico’s Spaceport America. Mission Control, This Is Apollo, by Andrew Chaikin (2009). Excellent text and the art work of Apollo astronaut Alan Bean create a powerful combination. Mission: Mars by Pascal Lee (2013). This wonderfully-illustrated children’s book is packed with clear explanations, fun-to-know facts about Mars, and personal tips about exploration from one of NASA’s top planetary scientists. Mission to Pluto by Mary Kay Carson (2017). Outstanding group biography including profiles of the New Horizons mission team members and the dwarf planet itself. Moonshot: The Flight of Apollo 11, by Brian Floca (2009). Liftoff with the crew of Apollo 11 and enjoy an utterly captivating first journey to the Moon. The Mysterious Universe: Supernovae, Dark Energy and Black Holes, by Ellen Jackson (2008). The best way to learn about supernovae, dark energy and black holes. NASA Planetary Spacecraft, by Carmen Bredeson (2000). Provides kids a great introduction to the planets and moons in our solar system via images returned by spacecraft. Nefertiti the Spidernaut: The Jumping Spider Who Learned to Hunt in Space by Darcy Pattison (2016). The true story of a jumping spider sent to the International Space Station in 2012. Older than the Stars, by Karen C. Fox and Nancy Davis (2010). Illustrates on several levels how your child is made of stuff that has existed since the beginning of the Universe. One Small Step: 40th Anniversary of the Race to the Moon, by Peter Murray (2009). A round book that looks (and feels!) like the Moon. Out Of This World: New Mexico’s Contributions to Space Travel, by Loretta Hall (2011). From Goddard’s early rockets to a modern spaceport. For young adult to adult. Pieces of Another World, by Mara Rockcliff (2005). A heart-warming story that will educate and excite children to watch the sky for meteors and encourage parents to observe with their children. Planet Earth: Guide to the Planet, by Steve Murrie and Matthew Murrie (2009). Excellent resource for young readers to learn about the natural diversity of Earth. The Planet Thieves by Dan Krokos (2013). A fast-paced space adventure with characters designed to appeal to teen readers. Reaching for the Moon, by Buzz Aldrin (2005). Captures the spirit of Apollo 11 astronaut Buzz Aldrin, a genuine American hero who shows how to pursue dreams with determination, strength, and persistence. Ringworld: A Graphic Novel, Part 1 by Robert Mandell and Larry Niven, illustrated by Sean Lam (2014). A young adults graphic novel adaptation of the first half of Larry Niven’s award-winning novel, Ringworld. Robots Slither, by Ryan Ann Hunter (2005). A rhyming picture book that provides an overview of the types of modern robots and is fun to read, with sidebars that provide plenty of facts that should entice kids to embrace a future full of friendly robots. Saturn for My Birthday, by John McGranaghan (2008). A playful and engaging book about the planet Saturn for young children and their parents to enjoy together. Saving Mars by Cidney Swanson (2012). A fast-paced story of a young pilot and her autistic brother who must travel from Mars to Earth to obtain the food they need to survive on the red planet. The Seven Stars of Matariki by Toni Rollerston-Cummins (2008). This picture book is excellent for sharing another culture and also the wonder of the night sky with children. Seven Wonders of Exploration Technology, by Fred Bortz (2010). Enticing introduction to the man-made wonders that expand our knowledge of Earth and space. Shanghaied to the Moon, by Michael J. Daley (2007). An excellent science fiction adventure appropriate for middle grade and young adult readers. Skye Object 3270A by Linda Nagata (2010). Teens bungee jumping from a space elevator, exploring a planet with hostile alien animals, and solving the mystery of how one girl became the sole survivor of an alien attack are all part of this book. Sky Horizon, by David Brin (2007). A back story for an upcoming series, Colony High, about teenagers struggling to survive on another world. Space Boy and His Dog by Diane Curtis Regan (2015). A young boy and his dog and robot “fly” their cardboard spaceship to the Moon on an imaginative “mission” to rescue a lost cat. 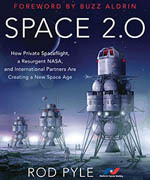 Space Station Science, by Marianne Dyson (2004). A must for families with space-happy kids. With easy-to-understand explanations and wonderful illustrations, it covers getting there, coming home, and everything in between. Spacer and Rat, by Margaret Bechard (2005). Engaging story of two young people on a space colony in the asteroid belt; impressive job of creating a complete fictional world. Star Wars: A Galactic Pop-up Adventure by Matthew Reinhart (2012). Packed with Star Wars settings, characters, and inventions, providing hours of fun. Taking Off, by Jenny Moss (2011). A teenage girl meets Christa McAuliffe in a novel for all young adults interested in history, space, or who are just trying to decide what to do with their lives. Team Moon, by Catherine Thimmesh (2006). With breathtaking photos and a lively text, Team Moon will hold the attention of even the most reluctant reader as it relates behind-the-scene stories of Apollo 11. For ages 10+. The Three Little Aliens and the Big Bad Robot, by Margaret McNamara (2011). An adorable space version of The Three Little Pigs. The Web of Titan (Galahad Series Book 2), by Dom Testa (2006). Nicely weaves the personal stories of the characters with the actions involved in solving a mystery and averting a threat to the ship. 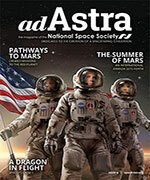 Welcome to Mars: Making a Home on the Red Planet by Buzz Aldrin with Marianne Dyson (2015). A high-quality, thoughtful, and clearly written book that encourages young people to build a settlement on the planet Mars. You Wouldn’t Want to Be on Apollo 13!, by Ian Graham (2003). An account of the ill-fated Apollo 13 mission that is both nail-biting and humorous.